The Ronson Tropicana Set was manufactured between 1954 and 1956 in Newark, United States of America. 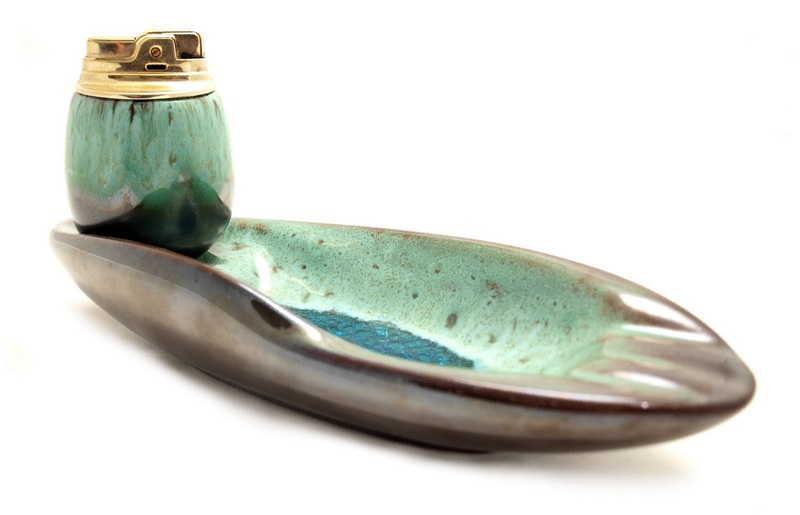 The set consists of a table lighter with a Ronson Essex gold toned insert and an ash-tray which is made of brown and inner green ceramic. The set (model no. 43592) looks great and is quite rare. Other unique ceramic sets made by Ronson beside the Tropicana Set are: Bolero and Fiesta Set which are also rare. Two different magazine advertisements prepared by "Ritepoint" Miller Liter Co. based in St. Louis, U.S.A. 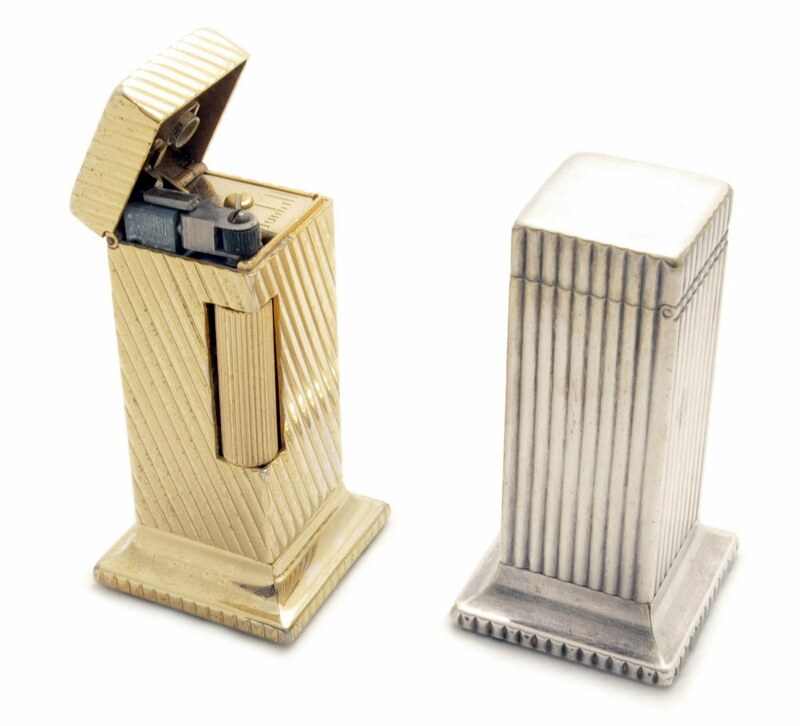 The Ritepoint company manufactured in general two models of lighters - a pocket and a table lighter. Both had a visible fuel tank which was a novum in the 1940s. The advert on on right was published in 1950 in the Saturday Evening Post and that one on the left was published in 1949 in the December issue of Esquire. This interesting Ascot magazine advertisement was published in LIFE, on the 17th November 1952. It depicts among others three table lighters: 'The Pagoda Set', 'Florentine Dagger Lighter' and 'Olympia'. All of them were made by A·S·R· Corp (Ascot). 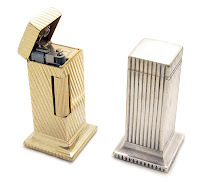 The Dunhill Rollalite Lighter is one of the most famous lighters made by Dunhill. It was first manufactured between 1949 in the United States of America and Switzerland by Alfred Dunhill ltd. 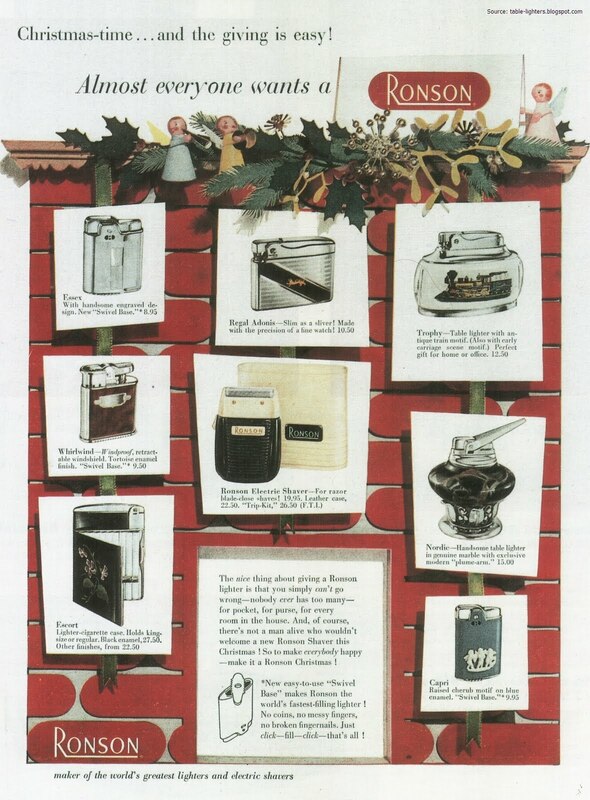 The production of the wick lighter ceased in 1956. 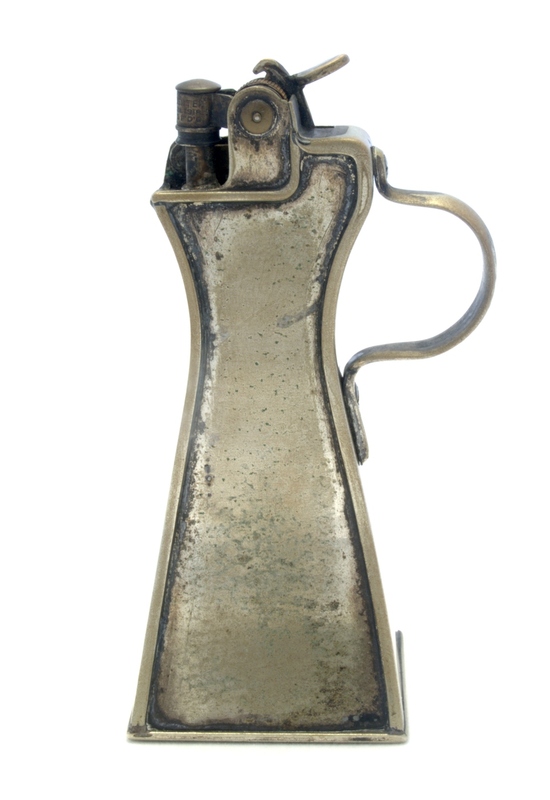 This small and handy automatic table wick lighter was manufactured basically in five finishes – 18K gold, gold plate, sterling silver, silver plate and rhodium plate. It was moreover available striped in couple of variants. The quality of this lighter was very high. 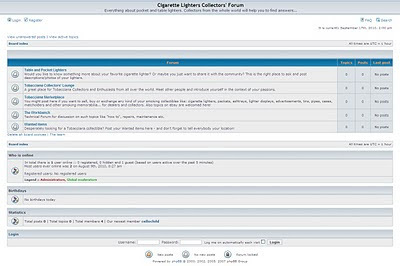 Cigarette Lighters Collectors' Forum is now open! 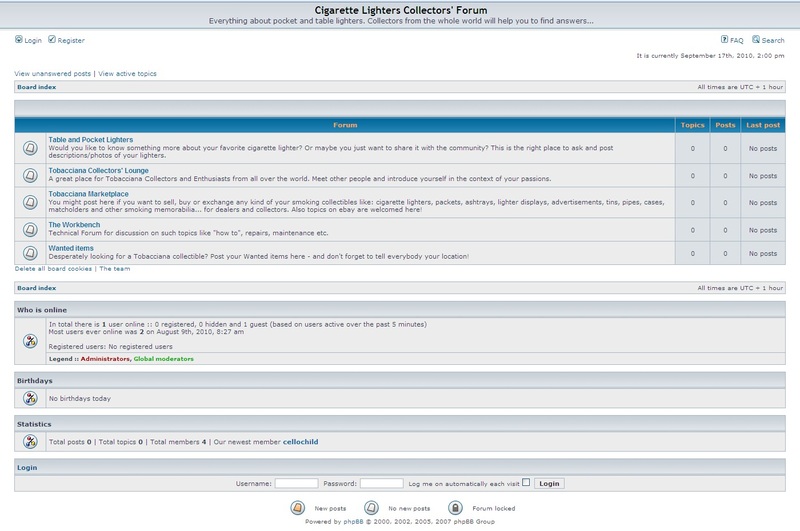 I am happy to present you the first international Cigarette Lighters Collectors' Forum. This step was inevitable as I received every day more and more inquires via email. Now you might register yourself and post your thoughts and questions there. I hope that in this manner more people will have access to collectors' knowledge and experience. Everybody is welcomed! Update: The website is closed now as I was not able to win with thousands of spammer bots. I hope that in the future I will be able to return to this project. In the meantime I would like to apologies users of the forum who supported it with their knowledge! 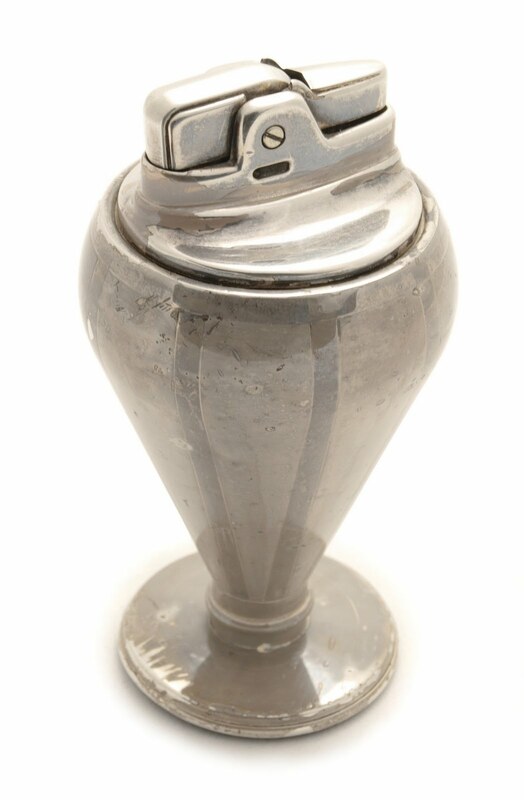 This wick lighter has a silver plate heavy cast white metal base. The bottom of the base is padded with black felt. This Dunhill Duelling Pistol of the shape of a classic single-shot flintlock from the XVIII/XIX century is made of brass and lead alloy which makes it very heavy. The lighter has a very precise trigger activated mechanism - the top opens and sparks when the trigger is pulled. 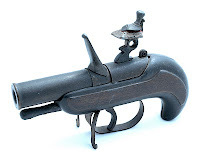 This Dunhill Duelling Pistol was manufactured only in England from ca. 1929 until the late 30's. 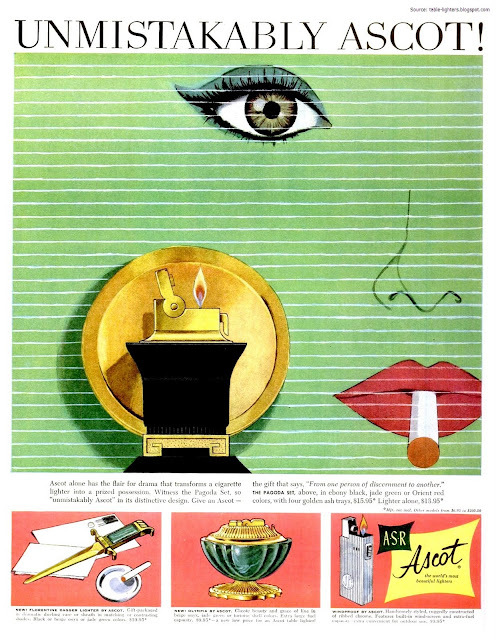 After 1938 it was replaced by the Dunhill Tinder Pistol Lighter. It is often the case that the trigger is broken as well the top mounted flint holder. The lighter is marked DUNHILL on the outside of the trigger guard. The Ronson "Tablelighter" came in two versions that can be distinguished by the applied lighter fitment: Banjo and De-Light. 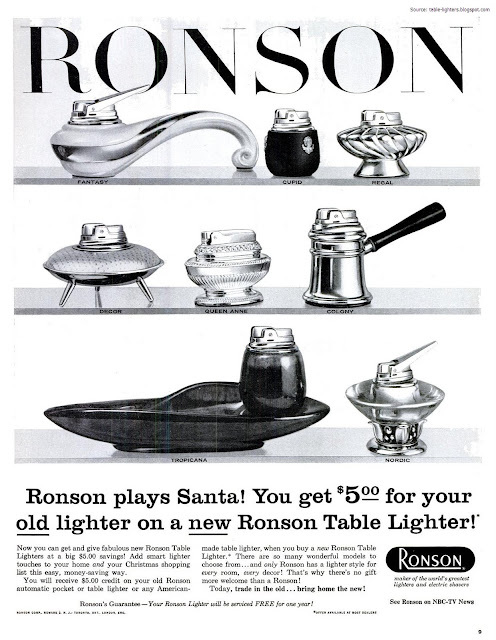 The older version (Banjo fitment) of the Ronson "Tablelighter" also called Ronson Banjo Table Lighter was manufactured between 1927 and 1928 in Newark, New Jersey, USA. It was one of the earliest tabletop automatic lighter in the world. The lighter was made of brass and silver plated. The front and rear panel were covered with snake and Marocco leather. Some of the examples were left without covering. The casing of the Banjo Lighter was designed by L.V. Aronson and patented on the 17th May 1927 (filled for patent on 2nd February, 1927). The illustration below shows a side elevation of the lighter and an edge view. It comes from the granted patent no. 72,658.